Fun in the sun, summer is finally here! You and your pup are probably excited to finally be able to spend more time outside. It’s time for barbecues, parks, pools, doggy play dates and so much more. Don’t forget that sunscreen…and not only for yourself, but your dog too. Dogs are also prone to sunburns and even skin cancer from high UV sunrays. Just be careful with some tips BarkBud has for you! Dogs that have thinner coats and have blonde hair are more vulnerable to getting burned than dogs with thicker coats. 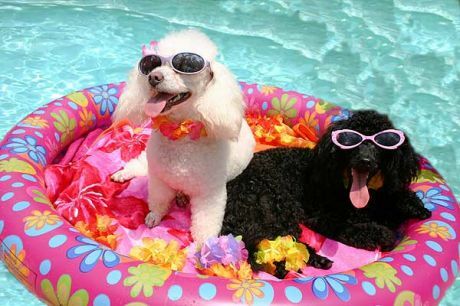 But all dogs are able to get sunburned and are at risk when there is too much sun exposure. Stay Shady: First off, your pup will naturally find shade if the UV rays are getting to them. Do always have a plan to get some shade in just in case. We suggest bringing a large umbrella for some shade, finding trees to hide under, or some sort of roof on the deck for those days you are hanging outside your place. Look Out: Some common areas to look out for dog sunburn is a spot on their nose, inside upper legs, belly and groin. Since dogs have sensitive skin on their ears, it’s another risky spot. So keep an eye out in those areas. Signs: If you aren’t sure what to look for with dog sunburns, it’s similar to us. Their skin becomes red and very sensitive skin when touched. If you see any cracked or skin, red spots, a tiny fever or even whimpering when you pet your pup, those are all signs of doggy sun burn. See all service areas here. © 2016 BarkBud | #1 Indianapolis Dog Walker with GPS Tracking. BarkBud provides GPS tracked dog walks and amazing dog walkers.